Paradigm scanner models include ROWE Scan 850i scanner series, Kurabo Flatbed scanner, Mobile Scanning Case and Colortrac SmartLF SG 36/44 series CCD scanners. The ROWE series scanners are offered in both 55 and 60 in. widths and scans up to 15.0 in. ips in color or mono. The Kurabo scanner is available in 24 x 36 in. or 36 x 50 in. models and are designed to scan fragile historical documents, books, textiles and 3D objects. Costa Mesa, CA – January 18, 2019 – Paradigm Imaging Group, a leading distributor of large format scanners, printers, multifunction systems, sign and integrated software solutions, announces with the recent addition of the ROWE Scan 850i scanner series to its scanner product line, that Paradigm Imaging Group now offers more than 60 scanner models from 6 different manufacturers – more scanner models than any other distributor. With models ranging from 25” to 60”, Paradigm Imaging Group has the ability to meet or exceed all scanning applications, including engineering or technical drawings, fine art or fragile documents, as well as non-conforming media or applications that require a Flatbed scanner. 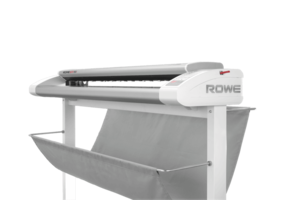 Our widest pass through model is the Super-Wide ROWE Series scanner available in both 55” and 60” widths. Built in Germany, these scanners are TAA Compliant, can scan up to 15.0″ ips in color or mono and the “T” model can scan media up to 30mm (1.18″) thick. The ROWE engineers have achieved a groundbreaking innovation with the new ROWE Scan 850i scanner. With an optical resolution of 2,400 x 1,200 dpi and the unique patented technology of ROWE Scan Matrix Plus, the ROWE Scan 850i promises a scan quality unmatched in the market. The Kurabo Flatbed scanner (24” x 36” or 36” x 50”) offers uncompromised flexibility to scan just about any type of original, including fragile historical documents, books, textiles and 3D objects. Mobile scanning has never been easier than with our NEW Mobile Scanning Case that works with the Colortrac SC 36 Xpress or the Graphtec 36” DT530. The award winning Colortrac SmartLF SG 36/44 series CCD scanners feature a wide color gamut and are ideal for full-color graphics, photographs and maps. Height adjustment allows for scanning media up to .6” thick. Paradigm Imaging also offers a range of MFP or Flex solutions that have become a popular addition to existing ink jet printers from Canon, HP and Epson. With scanner and software configurations from Rowe, Colortrac and Graphtec, customers can leverage their existing printers to have extended MFP functionality and performance compared to the basic MFP solutions currently available from HP, Canon and Epson. “We continue to strive to offer our valued Dealer network the largest selection in Wide Format scanners”, says Randy Geesman, President of Paradigm Imaging Group. Paradigm Imaging Group is a large format solutions provider whose expertise extends from scanning and outdoor applications to imaging systems integration, software development and product distribution. Paradigm counts among its client’s companies in engineering, construction and manufacturing, and the sign industry, as well as numerous public agencies at all levels of government. Since 1989, Paradigm has grown to become a leading provider of large format scanning and printing solutions.